This is the epic history of the 'iron men in wooden boats' who built an industrial empire through the pursuit of whales. 'To produce a mighty book, you must choose a mighty theme,' Herman Melville proclaimed, and this absorbing history demonstrates that few things can capture the sheer danger and desperation of men on the deep sea as dramatically as whaling. 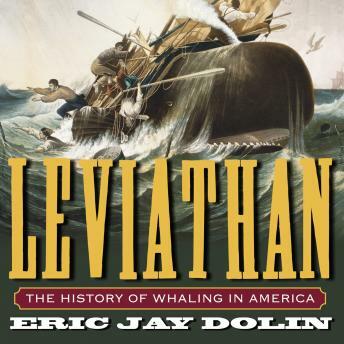 Eric Jay Dolin begins his vivid narrative with Captain John Smith's botched whaling expedition to the New World in 1614. He then chronicles the rise of a burgeoning industry-from its brutal struggles during the Revolutionary period to its golden age in the mid-1800s, when a fleet of more than 700 ships hunted the seas and American whale oil lit the world-to its decline as the twentieth century dawned. This sweeping social and economic history provides rich and often fantastic accounts of the men themselves, who mutinied, murdered, rioted, deserted, drank, scrimshawed, and recorded their experiences in journals and memoirs. Containing a wealth of naturalistic detail on whales, Leviathan is the most original and stirring history of American whaling in many decades.